Big Three. 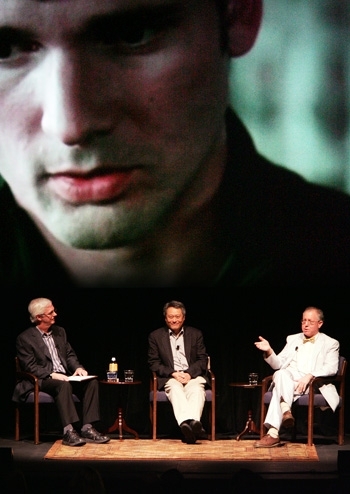 Ang Lee and James Schamus spoke in Zellerbach Hall on Monday as 'Ice Storm' screened in the background. Professor Jeffrey Knapp moderated the conversation. Speaking at Zellerbach Hall Monday night, Ang Lee and James Schamus brought their passion for cinema to the Berkeley campus. As scenes from "The Ice Storm" played overhead, the two luminaries discussed everything from cinematic subtexts to work habits and future collaborations, treating the audience to a rich discourse on the nuances of the filmmaking process. For Schamus, the experience has added significance: The producer-screenwriter earned his bachelor's, master's and PhD degrees, all in English, here at UC Berkeley. Over his prolific career, Schamus has collaborated with Lee on 11 feature films, writing nine and producing the other two. Their works have transcended genres and cultural boundaries, winning prestigious awards everywhere from the Academy and BAFTA to film festivals in Berlin and Venice. Their success on the international stage speaks volumes about the consummate nature of their works. "People say that globalization has become a reality, and it really has," Schamus said in an interview before the lecture. "When individuals get together and do small things, their words and actions become essentially universal." From intimate dramas ( "Eat Drink Man Woman") to rich period pieces ("Sense and Sensibility") and romantic epics ("Brokeback Mountain"), Lee and Schamus have created a body of work as varied as anything the cinema world has seen. Yet unlike many specific-minded auteurs of yesteryear, the two men avoid one-dimensionality with admirable acumen. Their films don't defy genre conventions as much as blend and unite them. Switch the films in the aforementioned categories around, and the characterizations remain palpably apt. As for their filmmaking philosophy, exploration is key. Asked how they choose projects, Schamus explained, "A lot of it is opportunity, impulse, trying to keep things fresh. Going from one kind of a film to another allows Ang and I to explore things we haven't explored before." In this respect, 2003's "Hulk" is their boldest experiment: Delving into the comic book genre, Lee and Schamus crafted a mature tale of Oedipal proportions that was as misunderstood as the tormented character himself. With their upcoming film, "Taking Woodstock," they plan to venture further into the possibilities of cinema by presenting a candid portrait of a bygone era along with the individuals that made it a reality. Collaborations between directors and screenwriters have produced no shortage of seminal film works. Alfred Hitchcock often relied on his writers to create scenarios before they envisioned them cinematically; Michel Gondry and Charlie Kaufman deserve equal credit for the masterpiece "Eternal Sunshine of the Spotless Mind." But for Lee and Schamus to collaborate as frequently as they have, it's no stretch to say that their symbiosis is a growing rarity. Schamus' take: "We strive for variety. Every film should say something different; making films with Ang Lee, you get to really learn different things, new things." Through a dazzling array of films documenting diverse aspects of humanity, Lee and Schamus have expanded the possibility of cross-cultural cinema in a global film culture. Their films combine artistic depth and narrative pathos, a sensitivity toward human connections as only the cinematic medium can capture. Forged from a thriving creative dynamic, their films aim at creating a panorama of the human experience in its entirety: fleeting, tragic and often profoundly moving.